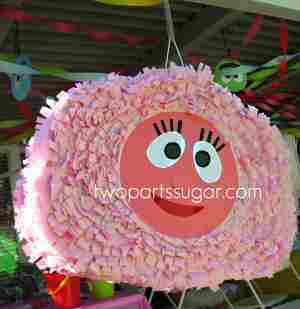 Yo Gabba Gabba Party Ideas for kids. This is a favorite for boys and girls alike. This is such a fun theme with so many cute possibilities! Celebrate Express has some cute inexpensive high quality party decorations. I've seen their banners, invitations, paper products and favors. 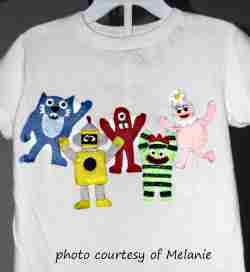 For those of you who are creative, here is a cute dress up ideas...make your own yo gabba gabba shirts for the birthday child! Muno: The cyclops who plays the guitar. Toodee: She's a blue dragon who performs on bass. Plex: He's yellow and plays the keytar. Brobee: The green monster who performs on drums. 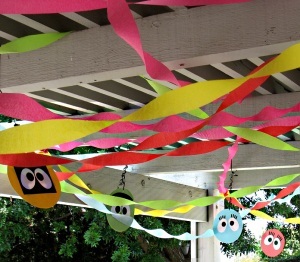 Colorful streamers with hanging Yo Gabba Gabba cut outs...how cute is that! This photo courtesy of Two Parts Sugar. Red, blue, yellow or white tablecloth. Yo Gabba Gabba balloons or yellow, pink, blue and green balloons. Print out Yo Gabba Gabba pictures and post around the party area. 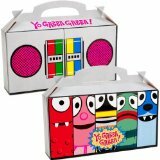 Cute favor bucket idea using colorful sand pails decorated with the Yo Gabba Gabba characters and filled with party favors. This photo is courtesy of Monica from Two Parts Sugar. Playdough in colors of the Yo Gabba Gabba Characters. You can make your own labels too to customize. 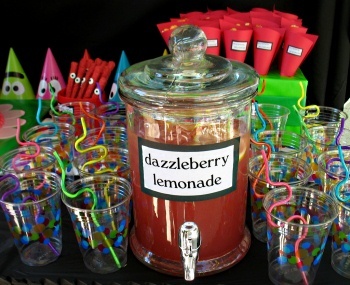 Red Punch or Pink Lemonade (Dazzleberry Lemonade) This cute drink idea is courtesy of Monica from Two Parts Sugar. Popcorn in red funnel shaped cones. Fun Shaped Sandwiches using cutters. 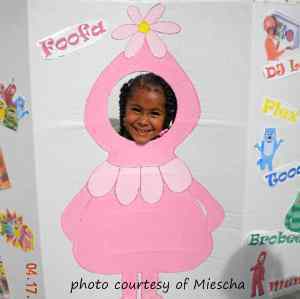 This cute party game was shared by Miescha. Thank you for allowing the use of your wonderful pictures! You can use cardboard, butcher paper and paint to make this game. Find a large piece of cardboard that can stand up. Paint a favorite character and add tissue and other materials to dress it up if you want. Then cut a cut a hole where the face goes. It's picture time!. PInatas are always a fun activity!